Teen suicide prompts call for manga censorship. The Parents Organization of the Ural federal District of Russia has called upon President Vladmir Putin to tackle one of the most pressing issues facing Russian society; a manga which ended in 2006. 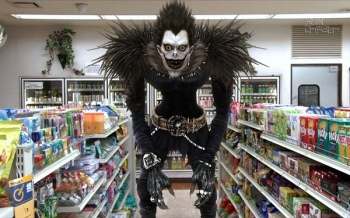 According to the local media, a letter from the organization calls for the President to halt sales of the Death Note manga, anime TV series and the two live-action movies. Apparently, the call for the ban stems from a tragic incident that took place back in February, in which a 14-year-old girl committed suicide by jumping out of the 13th story window of her home. Unfortunately, suicidal teenagers are not uncommon in the land of vodka, borscht and easy stereotypes for lazy writers. Russia has the third highest rate of teenage suicide per capita in the world, with 22 out of every 100,000 teens choosing to take their own lives. This, to me, speaks of a much larger problem, but Russian police instead chose to investigate the four volumes of Death Note found amongst the girl's possessions. For those of you who missed it; Death Note tells the story of Yagami Light, an intellectually gifted teen who finds a magical notebook which, among other things, will kill anyone whose name is written in it. Light quickly goes off the deep end and begins enacting a keikaku (translators note: Keikaku means plan) to more-or-less take over the world. It's a profoundly silly, yet undeniably tense, cat and mouse thriller, with just enough of a Burton-esque flair to its visuals to bring in the Hot Topic crowd. According to ANN, this isn't the first time Russian authorities have been called upon to investigate anime and manga imports. A Voice of Russia article from February of last year implied there is a causal link between anime and an ongoing wave of teen suicides. The article noted that many of the teens who had chosen to take their own lives came from well-to-do families and good educational backgrounds, and that many of them were anime fans. Now, I'm no statistician, but I did read a lot of manga in my youth, and I strongly suspect the higher suicide rate amongst manga fans has less to do with the content they're reading than it does the way they're treated for reading it.